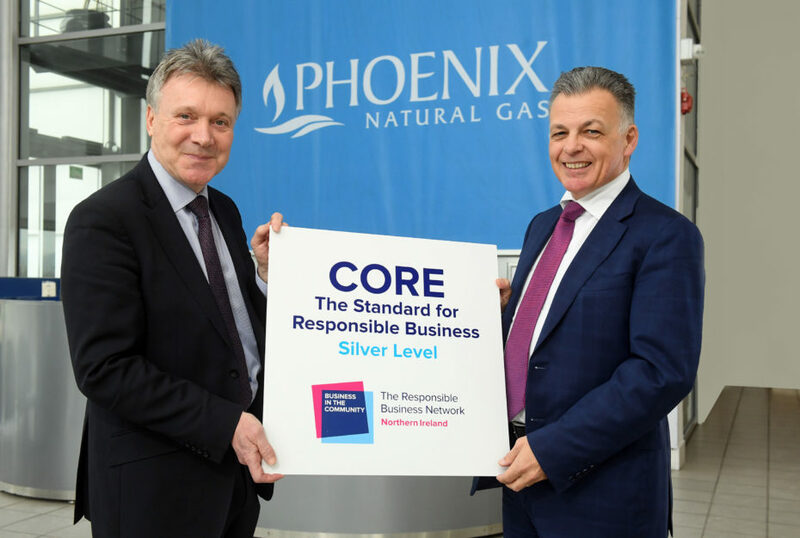 Phoenix Natural Gas, Northern Ireland’s largest gas distribution business, today announced that the company has achieved silver CORE accreditation from Business in the Community. CORE is Northern Ireland’s only corporate responsibility standard and is a framework for identifying and measuring corporate responsibility activity and performance across organisations. In achieving the accreditation, Phoenix Natural Gas has shown evidence of strong procedures that drive performance forward in all the key corporate responsibility areas of People, Planet and Place. Phoenix Natural Gas is among five companies to achieve the CORE accreditation this year. Michael McKinstry, Phoenix Natural Gas Chief Executive Officer, said, “Since arriving in Northern Ireland just over 20 years ago, natural gas has lit up the path to a greener future for local energy consumers. Today, Phoenix provides over 210,000 households with an energy source that has removed over 7.5 million tonnes of CO2 from the environment, the equivalent carbon saving of 350,000 cars removed from Northern Ireland’s roads. “Phoenix is proud of its environmental credentials as is the focus it puts on corporate social responsibility. For us, CSR is entwined with the business strategy, sitting comfortably alongside a long-term, sustainable business which is creating real economic, social and environmental value. Kieran Harding, Managing Director of Business in the Community, added: “CORE strategically supports companies to develop their approach to corporate responsibility. It has been designed to help businesses that are committed to integrating corporate responsibility into the way they do business by benchmarking performance across ten key business areas. “The process is verified by an external assessor and overseen by an independent panel of experts. By completing the CORE Standard, companies gain a better understanding of their strengths and weaknesses, providing a baseline for next steps and further improvements. The prestigious accolade will be formally presented to Phoenix Natural Gas at Business in the Community’s Responsible Business Awards, which take place on 30th May 2019 at Belfast Waterfront. These awards recognise Northern Ireland businesses for their outstanding contribution to their people, planet and places where they operate. As a result of gaining this accreditation, Phoenix Natural Gas is now eligible to enter the coveted „NI Responsible Company of the Year‟ category of the Responsible Business Awards, which is open only to members of Business in the Community that have achieved CORE.